The play was in our corner. There was no place to stand on the bench to see the ice other than to straddle players and precariously step around them. As usual, I had a pen in one hand and a lineup card in the other. The fracas involved my short-tempered centre who was being penalized again as the referee was just feet away and couldn’t miss it. Even as his arm was going up, I was getting angry at the kid’s actions. Swiftly, there was the usual pushing and whatnot, as midget AAA players might do. I was scribbling something when my pen slipped from my hand. Since I was huddled next to a seated player, the pen tapped off his helmet and bounced in a lovely arc onto the ice, right in front of one linesman who headed straight to the referee. While my player went to the box, the referee signalled to our bench that someone was to leave. I looked up and down wondering who’d gestured or said something. But the referee pointed at me. Huh, I shrugged. The linesman skated to me and told me I’d been ejected. Why, I asked. He couldn’t say. At the appeal hearing, the referee testified the linesman informed him I’d thrown my pen at him. When my turn came, I joked it would have been a feeble throw as the pen went about two feet. I described what happened as the referee sat across the table and listened. After hearing my story, he reversed his decision, admitting he’d made a mistake. My ejection was overturned; I won the appeal. That referee and I remain the best of friends 25 years later. What did I learn from this? Even the most innocent action can be misinterpreted depending on where you are and at what moment. Had the linesman not skated directly in front of me at that very instant, he wouldn’t have seen the pen. If the bench had room for me to stand without straddling bodies, the pen slip would have sent it to the ground. 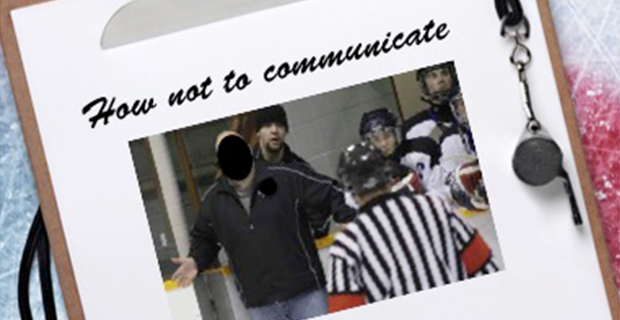 In mentoring coaches, I’m fairly stringent in one thing: there’s hardly a reason to discuss anything with an official in minor hockey other than for clarification. This is because most coaches just don’t know how to control their emotions; others can’t pare down their approach to something resembling a polite conversational style minus gesticulations and posturing. Best then to do or say nothing. One could argue this doesn’t do much to enhance referee-coach communication. Perhaps not. But until coaches are able to communicate without a show, it’s surely the safer approach.